The “Five-Way Flower” stamp gives the effect I was looking for and is much easier than the multi-layer suede-like flower I had been making previously. In addition, it is only $9.95 in the main SU catalogue. 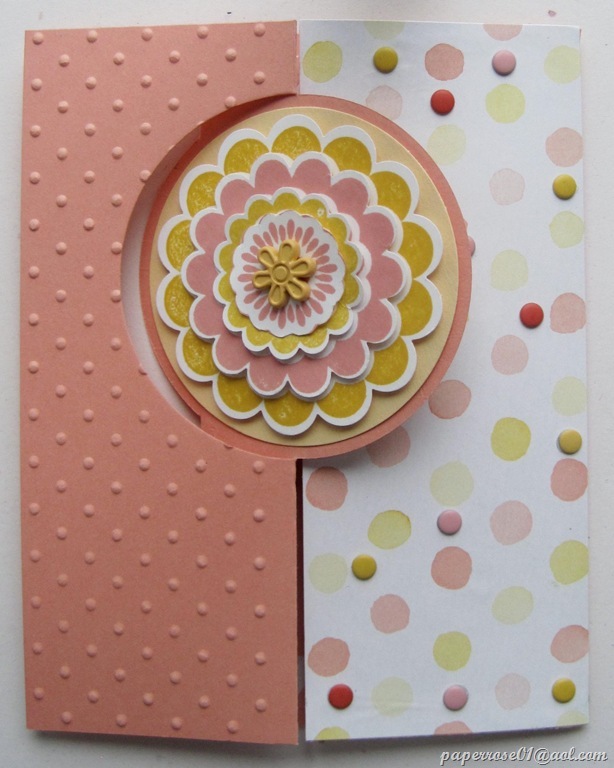 Cantaloupe Crisp cs was used for the card and the Perfect Polka Dot embossing Folder provides texture for the left front panel. My favorite Watercolor Wonder DSP softens the card and is highlighted with Candy Dots. I stamped the flower four time – first in Daffodil Delight, second in Crisp Cantaloupe, third in So Saffron, and finally in Crisp Cantaloupe. 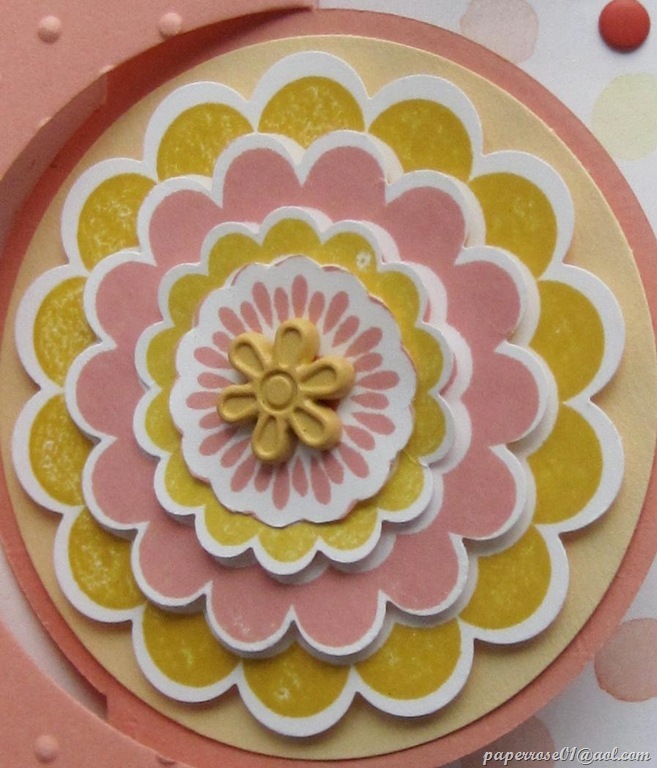 I punched out each flower using the 2 3/8”, 1 ¾”, 1 ¼”, and 7/8” Scallop Circle Punches. The layers are adhered with Stampin Dimensionals to provide depth, and anchored with a retired So Saffron floral brad. There are lots of different brads and buttons that can be used for the flower center. Because I like pink, I also completed a sample that uses Pink Pirouette in the flower , a pink rhinestone, and Pink Pirouette on the inner part of the card. This image shows a close-up of the completed Five-Way Flower. This image shows the inside of the swing card. I stamped Easter Eggs from a retired set and adhered them to the back of the swing circle. I completed another sample with a stamped bunny and basket with small Easter eggs on the back of the swing circle. 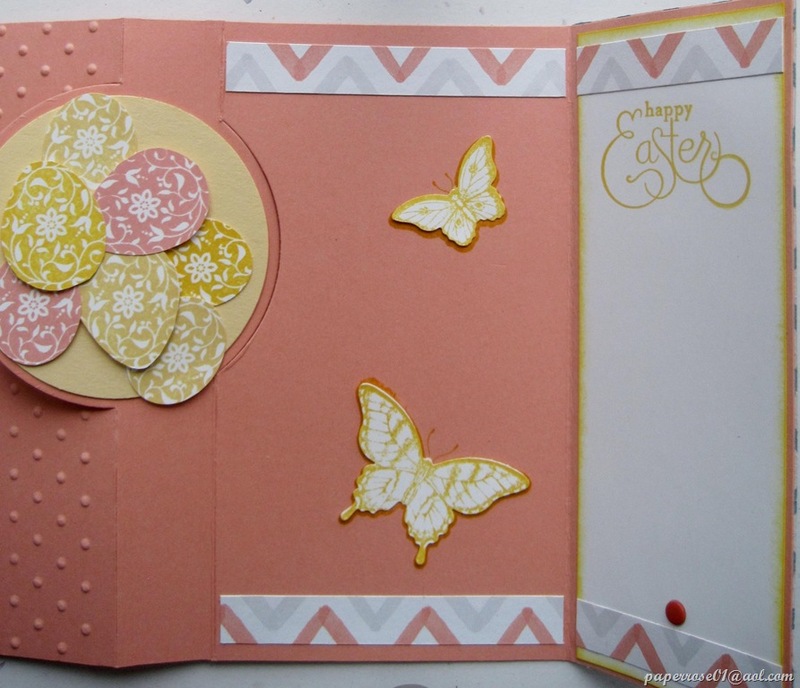 More butterflies appear using the Papillion Potpourri Stamp Set and the Elegant and Bitty Butterfly Punches. I carried the color theme thru with strips of Watercolor Wonder DSP on the middle and right hand inner panels. Finally, a single candy dot highlights the message panel. Die cutting the card with the extra message panel is a bit tricky, and I will be happy to show you how it is done. The Circle Card Thinlits Die is not shown in a current catalogue, but is available for $32.95. This is the final card we will create at the April Stamp Camp. As a reminder, dates/times are: Thursday, April 3rd from 2 – 9 PM; Friday, April 4th from 2 – 9 PM; Saturday, April 5th from 9 AM to 4 PM. If these dates/times don’t work for you this month, let me know and I should be able to accommodate an alternate date/time. If you can let me know ahead of time if and when you will be coming, it is helpful, but not a requirement. I always have extra packets ready. I will also have Tombo Mono Adhesive refills out for sale at $2.00 per refill/$12.00 per box of 6 refills. Mark your calendar now for the May Stamp Camp – May 1st, 2nd, and 3rd. Deb and I are still in the planning stages for May, so if there is something you would like to see us do, please let me know.